If you’ve read our style articles over the years, you’ll notice a recurring piece of advice: get everything adjusted to a custom fit! Fit will make or break any look. But for the man who’s just starting to upgrade his wardrobe, and doesn’t have a reliable tailor on call already, how can you tell a good shop from a bad one? There are a few key things to look for, so here’s the rundown for picking out a tailor that you can build a lasting relationship with! Before we worry about the quality of your tailor, how do you even find one? It’s not always as easy as finding a good restaurant or a big box retailer. Where do you go to find anything these days? Whether they have a website or not (and many tailors/alterations shops don’t), most businesses are listed on Google. As long as that business’s information is out there somewhere, Google’s going to find it eventually. This will be your handiest way to find a location, contact information, and website (if any) of your local tailors. Just type in “(your location) tailor” and also “(your location) clothing alterations” and you’re bound to find a handful of options. The big disadvantage is that Google is still not 100% up-to-date on business listings. Depending on where you live and the information that users have submitted in your area, there may well be some long-standing tailoring businesses that the search engine hasn’t located or identified yet. While phone books are becoming increasingly irrelevant (except for showing off your superhuman strength! ), they can still be especially handy for locally-owned mom-and-pop shops. The hardest part may be simply finding an up-to-date phone book in this day and age. If you haven’t received one at your doorstep lately (or if you left it to rot like everyone else), use phone book websites instead. Most of the old standards are still there: yellowpages.com, yellowbook.com, etc. This is probably actually the most comprehensive listing you’re going to get — many old-fashioned tailoring shops don’t have websites, but they’ve been providing their contact information to phone directories for decades. While Google has been slowly trying to incorporate user comments into its business search results, Yelp was designed from the start to offer user feedback. That makes it a good way to see what people are saying about businesses. If you find a tailor listed on Yelp.com, it can give you an idea of whether they’re worth visiting or not, based on what previous customers have said. However, as with any review-based site, Yelp tends to be full of “squeaky wheels,” and you shouldn’t necessarily let one or two people’s bad reviews eliminate a tailor from your list of options. In general, discard the very best and the very worst reviews, and trust those more in the middle. Do you know someone who’s consistently well dressed? Ask him what tailor he goes to. If he’s sharp-dressed enough for you to notice, odds are he’s got one. You can also ask your dry cleaner — most of them will have a tailor that they partner with for repairs and referrals. Many also do work in-house, although the focus tends to be on repairs rather than alterations. Lastly, you can ask the store where you bought the garment, or any upscale menswear store, for their recommendations. A few will have in-house tailors of their own, but most will send their customers to another local business they work with. Typically, if you do some searching in phone books and online, you should be able to find at least two or three options within driving distance. If you’re in a big city, the number can be considerably higher — you might have dozens of listed options. So how do you pick which one to approach? And once you do so, how can you tell if the business is going to work for your needs? Start by eliminating options that are obvious no-gos. Clear out anything that’s focused primarily on female clothing — seamstresses attached to things like bridal shops or formal dress outlets. Their expertise isn’t going to be in the kind of adjustments you want. This is also where you take online reviews into account. Don’t let one bad review put you off (or multiple bad reviews from the same, obviously disgruntled poster), but if a place has a lot of reasonable critiques from different customers, you want to take your money somewhere else. It might sound like an extraneous step, but call your possible options and ask a few simple questions. An easy test run is to ask about a specific type of alteration — taking a shirt’s waist in, say, or shortening jacket sleeves. You can ask about the price while you’re at it. This is testing a couple things for you. On the surface it’s actually providing useful information, of course — whether they can do the sort of alteration you need, and how much it’s likely to cost you. But you’re also checking the tailor’s communication and customer service skills. If the phone conversation is aggressive and irritable, or if the language skills are hard to understand, you should think about how much you want to deal with this business every time you need work done. You can ask about these on the phone or in person. It may feel a little rude, but it’s an important question — you want to see, in writing, what the place’s guarantees are for customer satisfaction and for damaged work. The former is important because some alterations just aren’t perfect the first time around. 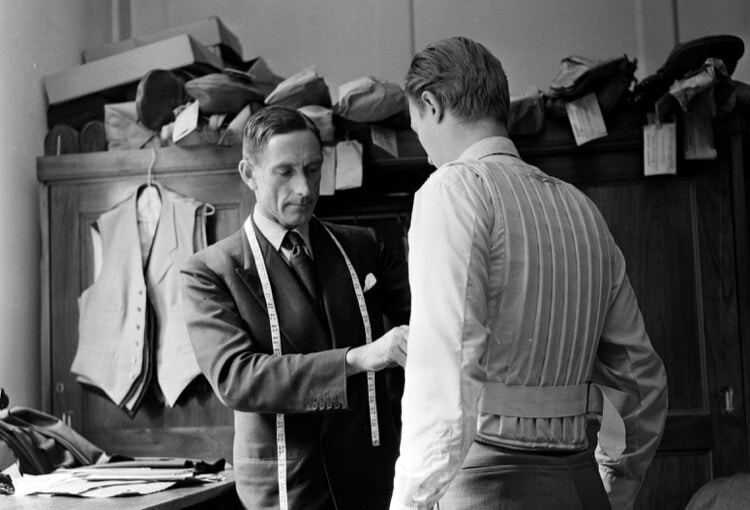 You want a place that considers the job “done” when you’re satisfied with the fit — even if that takes two or three rounds of alterations. You don’t want to be stuck paying the same flat fee each time. The latter is unlikely to ever come up, but accidents do happen. On the off-chance that yours is the jacket or trousers that get chewed up by a sewing machine gone rogue, you want a guarantee that’ll cover your actual cost of replacement, not the “adjusted value” of the garment. It doesn’t matter if a trade handbook says your wool slacks were only worth $25 after a year of wear — you’re not going to be replacing them for $25, so you’re going to need more than that back! Get an estimate on the time needed to perform the alteration. 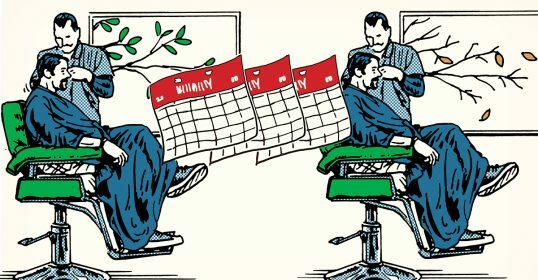 The best tailors are in constant demand, so expect their schedules to actually be fuller! A reasonable expectation for basic, minor adjustments (hemming trousers, for example) is anywhere from 2-3 days to a week or so, two weeks at the outside if the tailor is very busy. Larger repairs or more complicated adjustments could take a month, or 2-3 months in extreme cases. Assuming you’ve liked everything you’ve seen so far well enough to leave a job with the tailor, see how reliable and accurate the timing estimate was. If you’re getting constant delays and pushbacks, you might need to take your frustrations to a different store. This is actually a fairly minor consideration, and it shouldn’t be your primary motivation. Good tailoring is worth paying more for, and bad tailoring is a waste of money entirely. But it is worth doing at least a bit of comparison shopping. If a tailor is charging four or five times as much as the other options in the city, it’s worth asking yourself what he or she offers that justifies the price. That said, a tailor who satisfies both your clothing needs and your shopping expectations is a rare treasure. If you find one, don’t let the price stop you unless it’s truly outrageous.